PoPville » Rosa Mexicano Coming to Friendship Heights in Nov.
Rosa Mexicano Coming to Friendship Heights in Nov.
Rosa Mexicano’s 575 7th St, NW location. 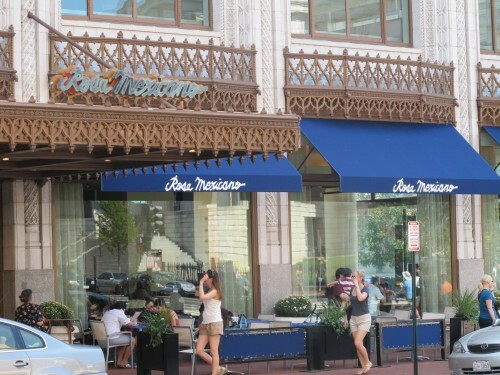 Rosa Mexicano Restaurants has signed a lease with Grosvenor Americas for 7,304 square feet of ground floor retail space within 5225 Wisconsin Avenue NW, a 93,000 square foot office building in the Chevy Chase submarket of Washington, D.C. The new restaurant, which is expected to open in November, will be the third Rosa Mexicano restaurant in the Washington, D.C. metropolitan area and the 13th nationwide. The other two national capital area restaurants are located in the Penn Quarter of Washington, D.C. and National Harbor in Prince George’s County, Maryland. Rosa Mexicano’s most recently opened new restaurant is in Miami’s iconic South Beach neighborhood. You can see their menus here. We judged the Penn Quarter location here. Fencing Go Up on North Capitol Street?